The local council of a large Swiss city delivers data packets to its information recipients in Switzerland's own XML standard "eCH". This daily process summarises all changes to the city's population from the previous day (so-called "events", such as people leaving or moving to the city, changes in marital status, births, etc.) and prepares each message in XML format. To ensure that no data is transmitted incorrectly, multiple times or not at all, it is important to monitor the output on data level. Using OMrun for this application scenario requires the XML files to be converted into a table structure, as well as a corresponding reference from the source system. This reference is created daily with an automated diff report (in CSV format), which lists all events from the previous day alongside the comparison data. 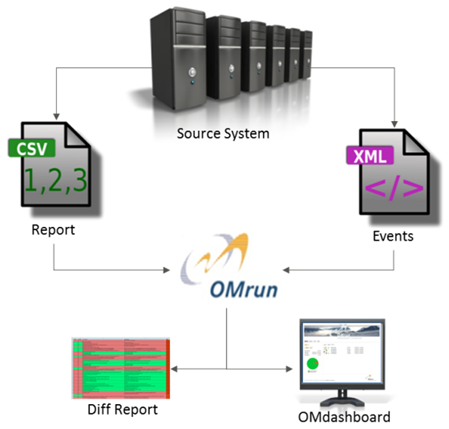 OMrun performs the XML conversion itself in a preparatory step. It thereby becomes possible to perform an automated, rule-based comparison of both sides simultaneously at data level. After this data reconciliation, a detailed report is generated, for which the differences (we call these "rule violations") are of particular interest. This rule violation report serves as the basis for making corrections in the production system.